Bootsman slide bearings: excellent choice when you require a high rotational speed. 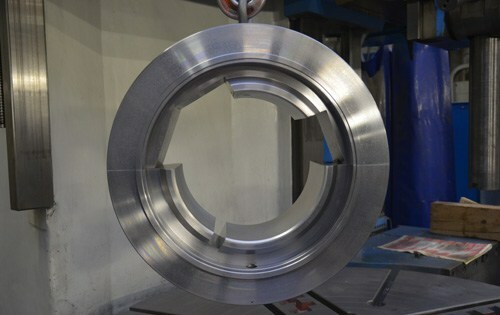 Bootsman professionals have years of experience in making slide bearings for gas and steam turbines. That’s why Bootsman slide bearings are applied in installations of Alstom, Westinghouse, Sulzer, Man and General Electric. Let us know what you need and we will make you a first-rate, custom-made and high-quality slide bearing that is built to last for many years of reliable operation. Every order is executed with acknowledged quality standards. Bootsman is slide bearing specialist for over 65 years. At Engineering Bootsman we have years of experience in working with turbines. We work with the most modern CNC machinery for the best results. Engineering Bootsman supplies many big and small manufacturers of turbines. Engineering Bootsman manufactures your new slide bearings according to your exact specifications, fast and with guaranteed delivery service. Slide bearings wear out. If the slide bearing doesn’t meet your demands, we can completely revise it. Advantages: quicker, cheaper and more environmentally friendly. Damaged slide bearing? Replacement isn’t always necessary. Repair is often possible, but not always. Contact us and we will inform you about all the options. Want to know more? In need of new slide bearings or a revision? Send us a message and we will make an appointment as soon as possible.